This was the second keto cookie we made in the KetoConnect kitchen, and for the second time we struck gold… or should I say fudge?! These cookies are perfectly soft and cake like, with an ever lasting chocolatey taste. And, they are by far Matt’s favorite. To give you some insight, Matt will literally eat anything. He loves ANY dessert so long as it doesn’t have a weird smell. And, even with all possible keto desserts to choose from he has chosen these Chocolate Fudge Keto Cookies. If that doesn’t say it all than I don’t know what does! 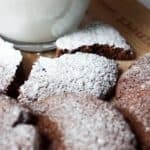 These Chocolate Fudge Keto Cookies are great for any occasion, but have come at no better time than now, the holiday season. As you attend parties and dinners, and bake desserts for the rest of your family you can have these keto delights right there ready for you to enjoy! Our favorite part about these keto cookies is how simple they are. The subtly sweet, intense chocolate flavor that you get with each bite is the result of some unsweetened coco powder. The coco powder mixed with the almond flour gives the cookie a soft, chewy texture great for dipping in coffee or almond milk, or leaving out for santa hehe. You add some peppermint extract to these to make mint chocolate cookies as well! The real reason Matt loves these cookies is the consistency of them. They are soft, cake-like cookies. That can be hard to achieve when it comes to keto baking, but the cocoa powder in these really allows you to achieve a nice, soft baked keto cookie! They are so good that it was hard for us, including Miley, to keep our hands (and paws) off of them. Not to worry though, we got some great pics before they were devoured! Combine cocoa powder and swerve confectioners sugar in a mixing bowl. Add melted butter to mixture and combine with a hand mixer. Once combined, add eggs, vanilla, and baking powder and mix again. Now add the almond flour and mix one last time. You should have a fairly thick batter that can easily be shaped by hand. Form into cookies and place on a greased baking sheet. The cookies will remain the shape you form them to after cooking. They do not expand too much. Bake at 350 for 12-15 minutes. Let cool and enjoy! These are great straight out of the freezer as well. These can be frozen for 2-3 months!